This waterless cleaning spray works quickly and easily to help clean surface stains so your beautyblender and makeup brushes are always in prime condition. 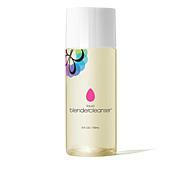 Spray directly onto the beautyblender or brush until stain is saturated. Sweep tool onto tissue or towel to remove residue. Repeat if necessary. Although this does clean your brushes it is very oily and you have to scrub the brush on a towel to soak it up. Plus it runs out way too fast. I washed some brushes twice and it was gone. Definitely sticking to Cinema Secrets quick dry cleaner. Way better. I will be returning this item. 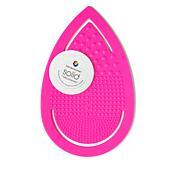 It says it is a waterless cleaner for the beauty sponge and brushes. It says ti spray till saturated and then sweep on tissue to remove residue. 1st smell is horrible, 2nd it is so greasy/oily that i don't want thar anywhere near my face. It is nit what i thought it was so i will not be keeping it.